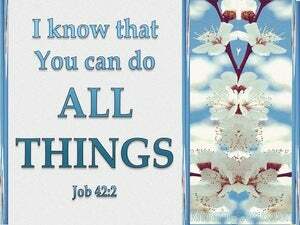 ﻿ Job 42:2 "I know that You can do all things, And that no purpose of Yours can be thwarted. 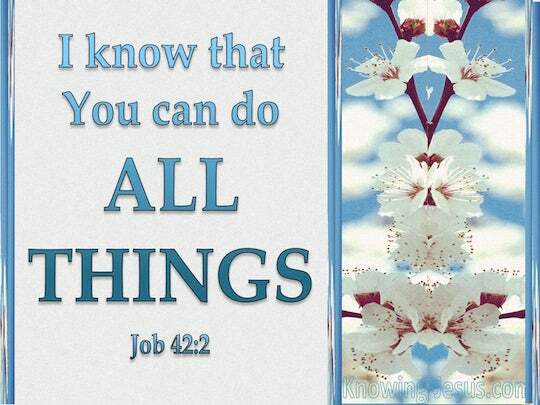 I know that thou can do all things, and that no purpose of thine can be restrained. I knew that thou wilt be able to do all, and counsel shall not be restrained from thee. 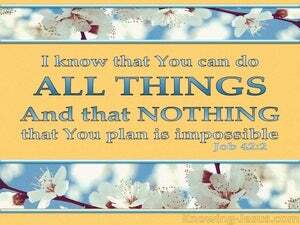 "I know that you can do all [things], and [any] scheme from you will not be thwarted. I know that You can do all, and not any purpose is withheld from You. "I know that thou hast power over all things, and that there is no thought hid unto thee. "I know that you can do all things, and that no purpose of yours can be restrained. I know that, all things, thou canst do, and that no purpose can be withholden from thee. 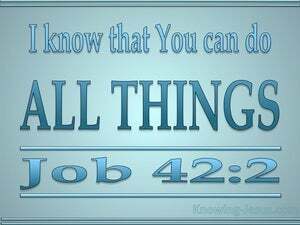 1 Then Job answered the LORD and said, 2 "I know that You can do all things, And that no purpose of Yours can be thwarted. 3 'Who is this that hides counsel without knowledge?' "Therefore I have declared that which I did not understand, Things too wonderful for me, which I did not know."